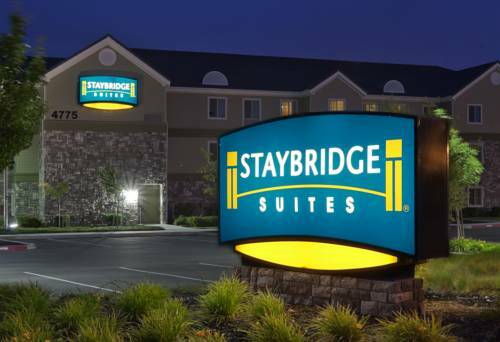 Experience the charm and hospitality of Staybridge Suites Fairfield/Napa Valley, an extended-stay all-suite hotel. Located between San Francisco and Sacramento, the hotel is just minutes from Napa Valley Wine Country. Other area attractions include Six Flags Discovery Kingdom, Infinion Raceway, and the Budweiser Tour at Anheuser Busch. Corporate travelers will enjoy easy access to companies such as Kiewit, Johnson and Johnson, Copart, Jelly Belly, Travis Air Force Base and Boeing. Retreat to superior accommodations that include complimentary amenities such as a daily hot breakfast buffet, evening Social reception with beer and wine on tap, Mondays through Wednesdays 5:30pm to 7:30pm. Open 24/7 is our fitness center, business center with fax and copy services and laundry facilities; all complimentary to guests. Our spacious suites have fully equipped kitchens with refrigerator, microwave, stovetop, and dishwasher. Every suite has a 32" flat screen high definition TV. Childrens's program - Hotel has an indoor pool. Scandia, a Family Center which provides nine-acres of entertainment for the entire family is just a couple of minutes away from the hotel. Kids will enjoy the miniature golf courses and lasertag the center provides. Napa Premium OutletsFind Impressive savings at Ann Taylor, Banana Republic, Barneys New York, BCBG Max Azria, Brooks Brothers, Gap Outlet, Calvin Klein, Coach, Cole Haan, Guess, J.Crew, Jones New York, Kenneth Cole, Lucky Brand, Talbots, Tommy Hilfiger, TSE and more. Cardonay Golf CourseChardonnay Golf Club is a 18-hole semi-private golf facility located Southeast of the city of Napa in Jameson Canyon at the gateway to the world renown Napa Valley wine district. Six Flags Discovery Kingdoma 135-acre park featuring awesome rides, great shows, and incredible attractions.